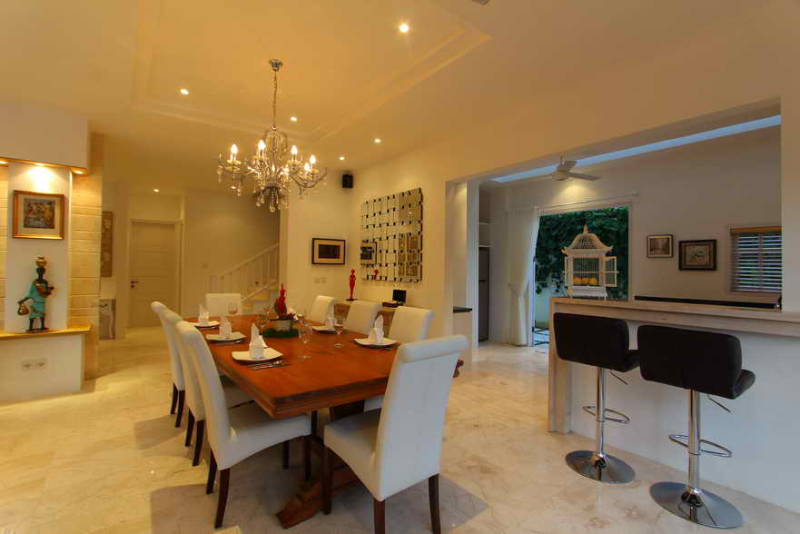 From $ 794AUD per night We have direct contracts with most villa owners. We don't add any booking fees. We are 100% transparent with no nasty surprises. 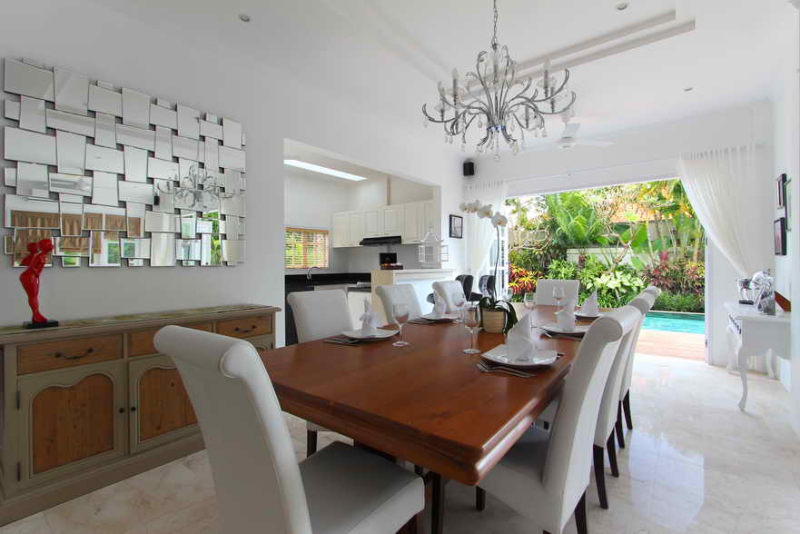 Villa Kencana is a 3 bedroom Seminyak holiday villa rental located in the lovely area of Seminyak. 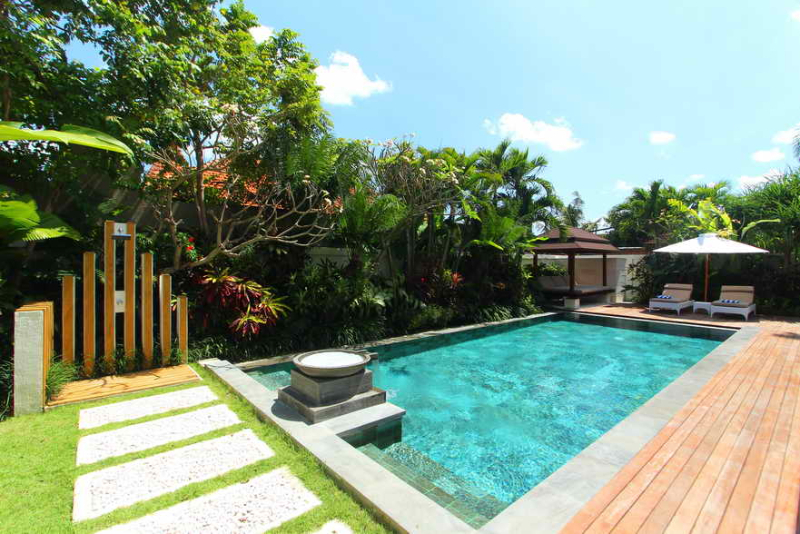 It’s private, luxurious, spacious and very appealing if your wanting real value for money on your Bali holiday. 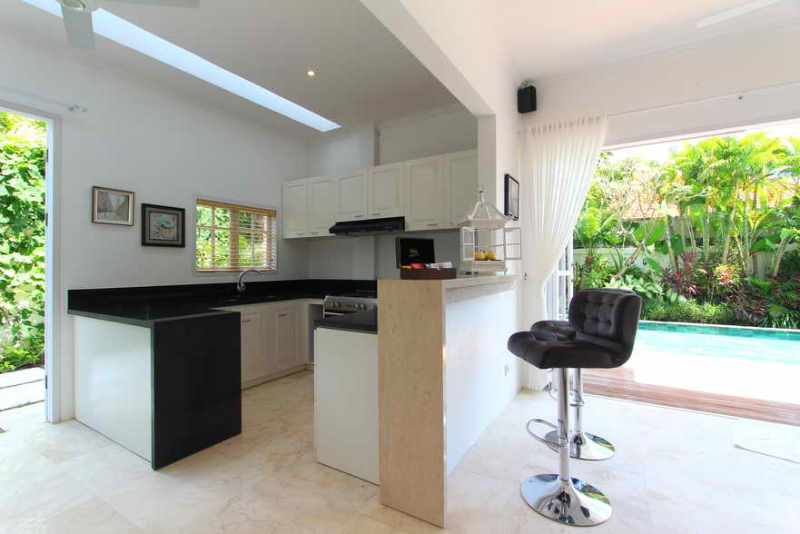 With three bedrooms, it is perfect for small families or groups of friends who want to experience the best that Bali can offer at a reasonable price. 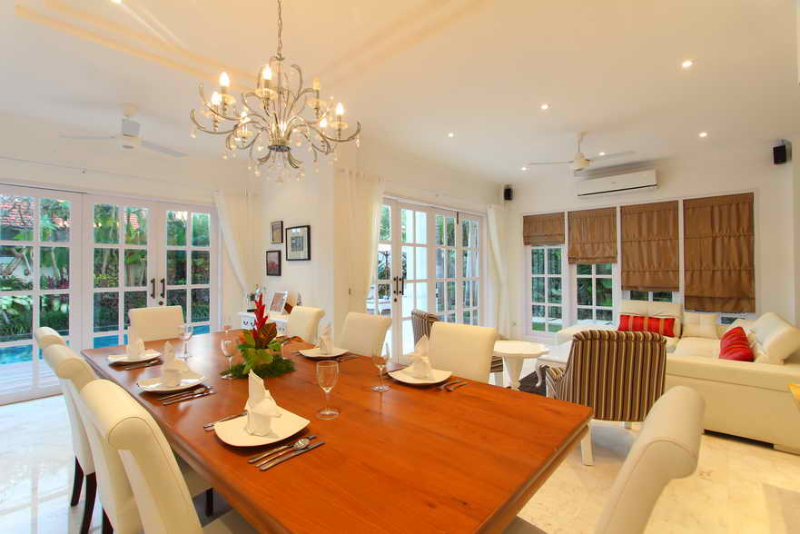 The villa has a beautiful colonial architecture and is serene and tranquil. 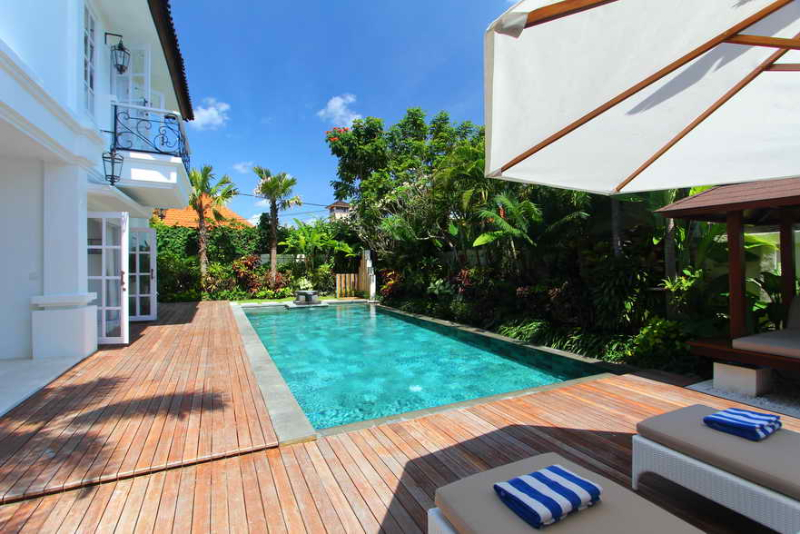 Although you in the heart of Seminyak you won’t hear any outside noise. 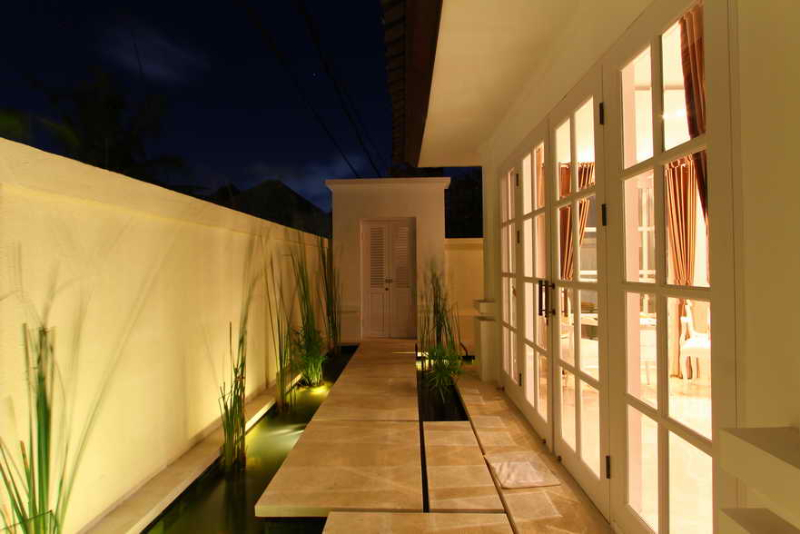 As guests enter through the gates of Villa Kencana, they step into a tropical haven which is simply divine. 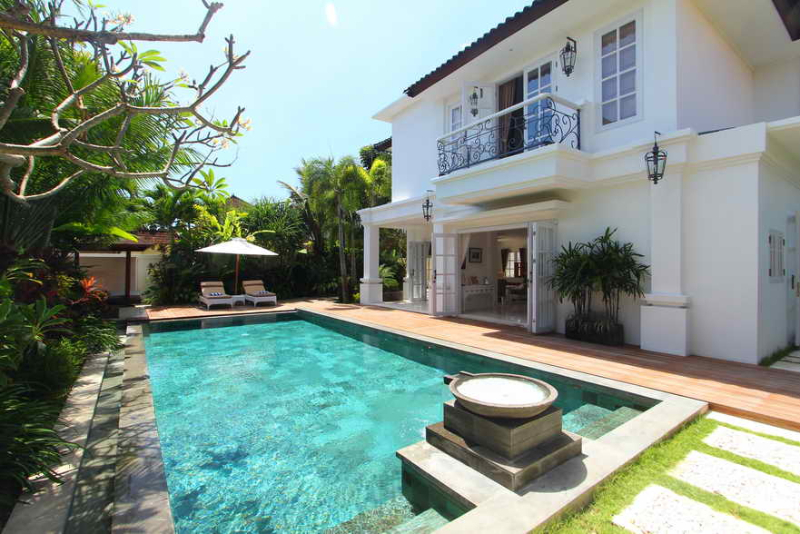 Tall palm trees sway in the wind and lush lawns and beautiful flowers complete this villa’s picturesque look. 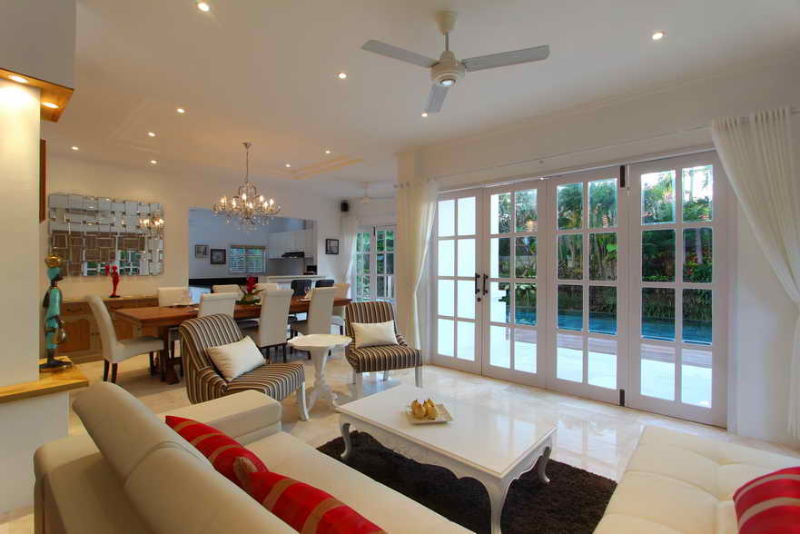 The white two storey building overlooks a lovely pool and lining the pool on one side are beautiful plants and shrubs which create and enticing outdoors. Tucked into one corner of the gardens is a bale which is always cool and cozy as it is partially shaded by the plants. The bale is a perfect spot for comfortable outdoor relaxation. 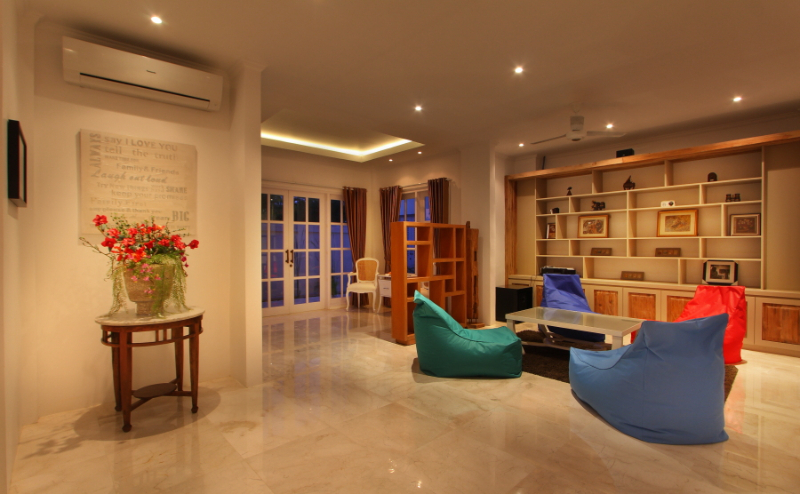 On the ground floor of the storey building is the stunning living area of Villa Kencana. 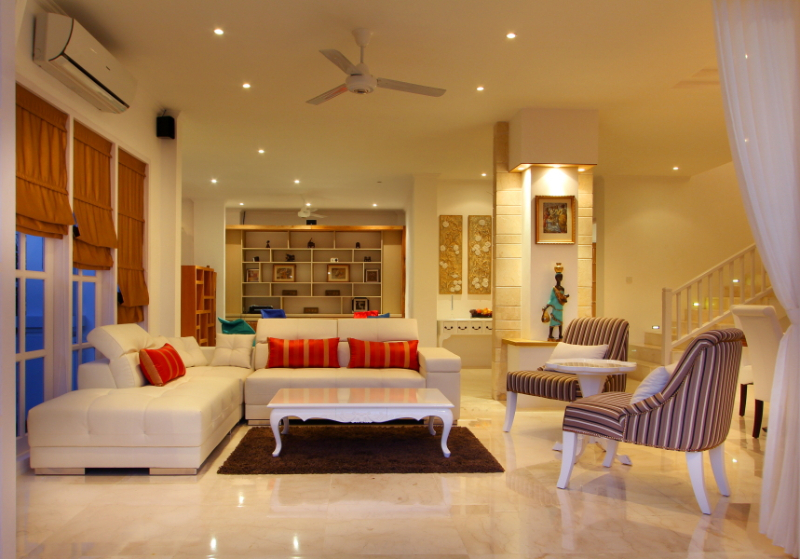 It is a lovely vision of white as it is furnished with white sofas, which blend in quite well with the white walls. 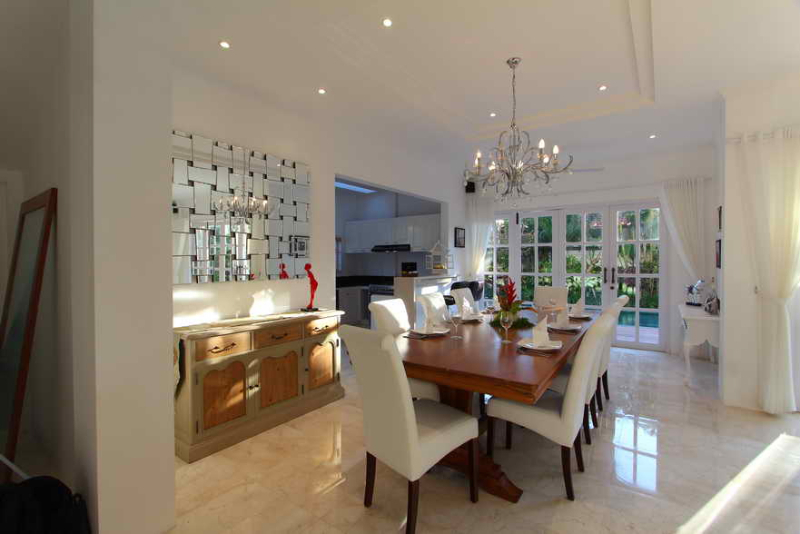 Beside the sofa set is a white dining set capable of seating 8 persons and beside this is the modern kitchen of the villa. 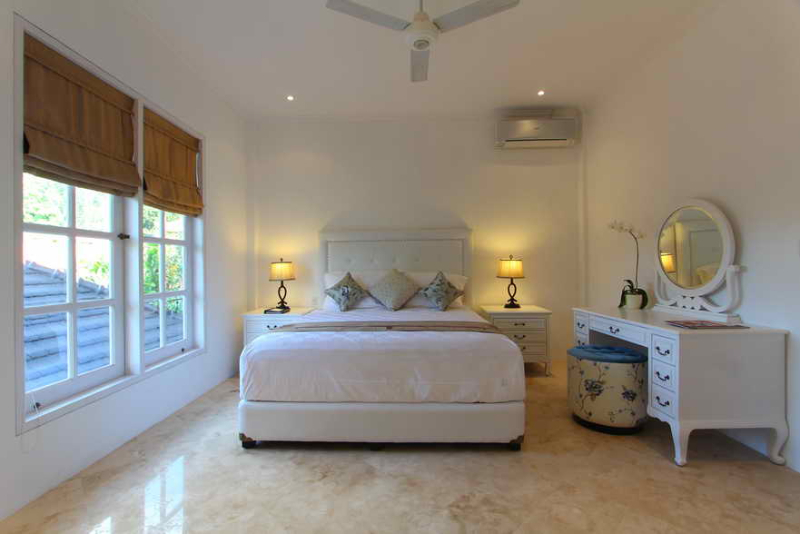 The décor of the villa is both traditional and contemporary, with miniature Balinese statues placed all around with beautiful lighting and paintings. 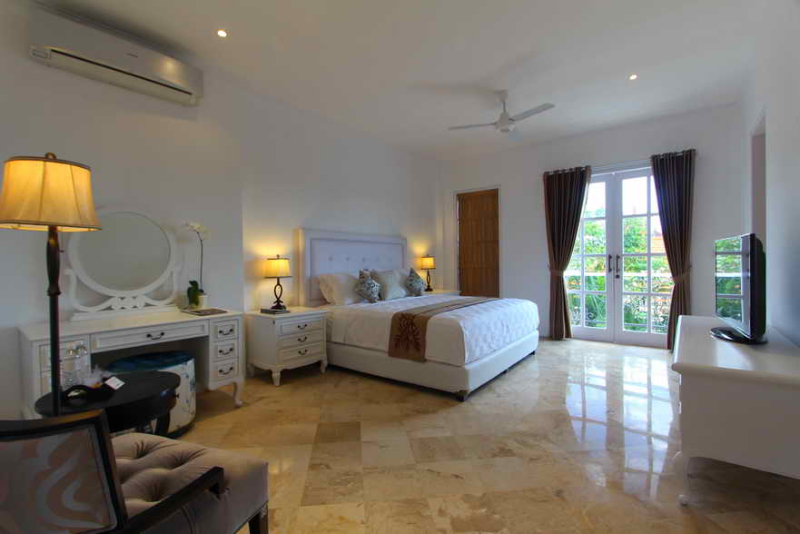 Villa Kencana has three beautiful bedrooms, with two upstairs and one on the ground floor. 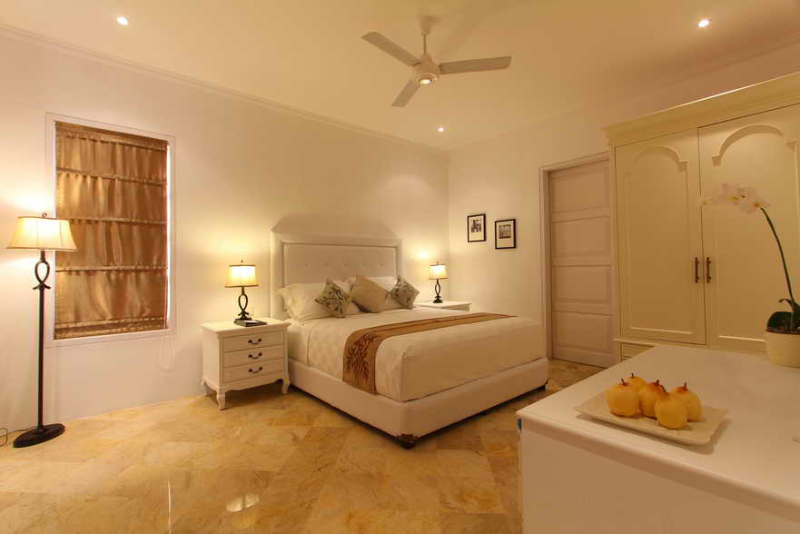 The bedrooms are tastefully furnished and quite elegant. 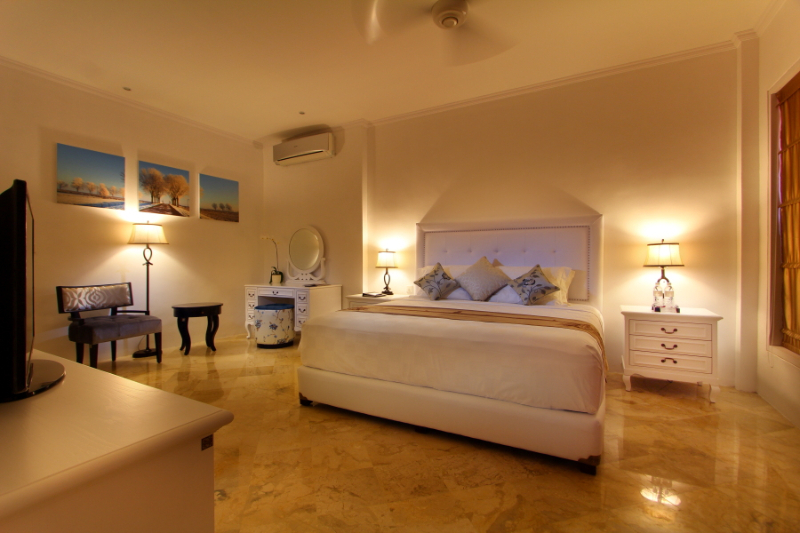 They are decorated predominantly in white colors and they all have a queen bed, beautiful colonial style vanity set, a TV, a comfortable chair and glass doors leading out to a private terrace for the bedrooms upstairs. 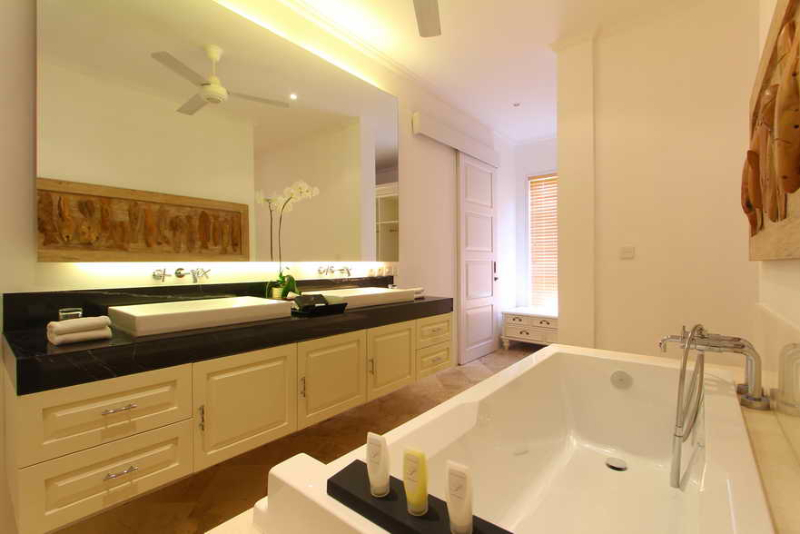 Guests will find that all the facilities are modern and in pristine condition. 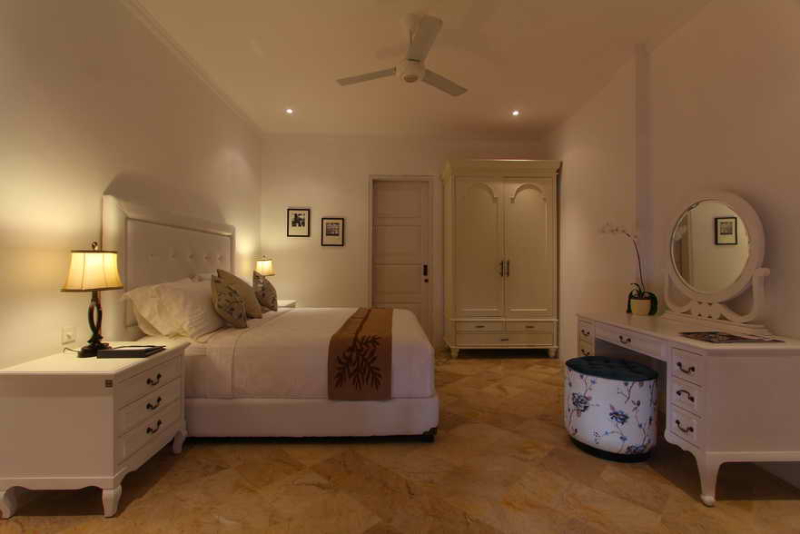 The villa is managed by efficient, professional, courteous & pleasant staff who would ensure that your stay is relaxing and comfortable. 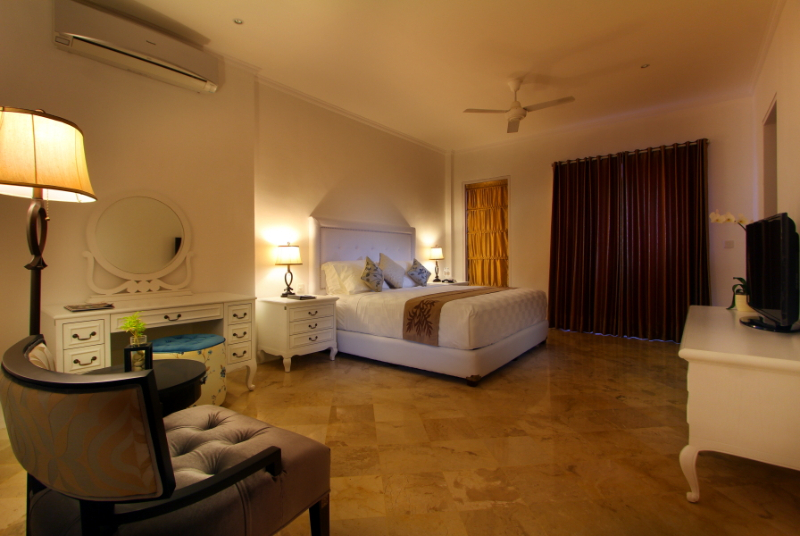 They include housekeepers, pool and garden attendants and a villa manager. We can also help you arrange tours, excursions and sightseeing of the interesting spots on the island. 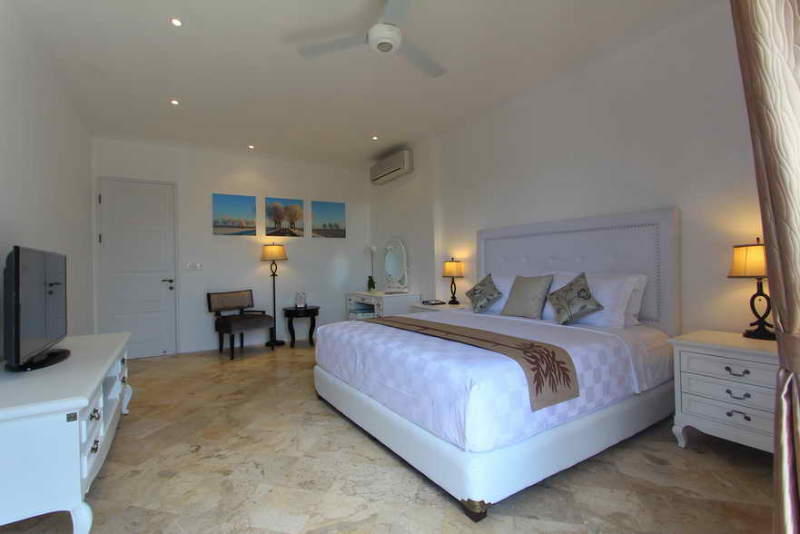 The villa is only a short walk from the Petitenget Beach and also minutes away from Seminayk main shopping and dining area. 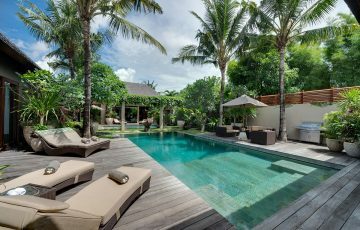 At Seminyak, you will find the best cafes, world famous bars, clubs, yoga studios and restaurants; Ku De Ta, Potato Head, Sisterfields, Grocer & Grind, Monsieur Spoon & the new Seminyak Village etc. You will absolutely love this place. 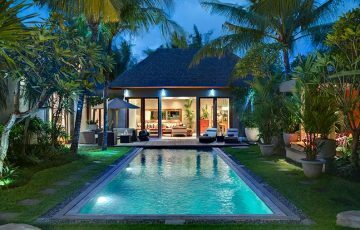 To view other family friendly Seminyak villas or our full range of 3 bedroom Bali villas near Eat Street & Seminyak village, please browse this website or contact our reservation team. 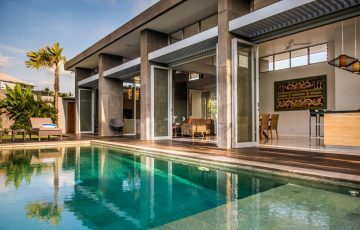 This is a popular Seminyak villa rental so if your planning a trip to Bali, especially during the Australian school or public holidays please book Villa Kencana well in advance. We spent a fabulous week here with our family of 5 & from the second we arrived we immediately felt at home. 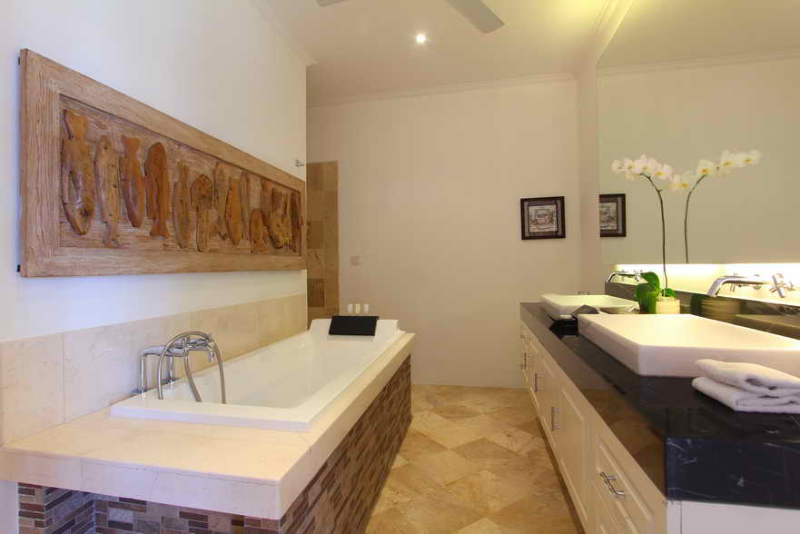 Kencana is gorgeous with a very warm and inviting feel. 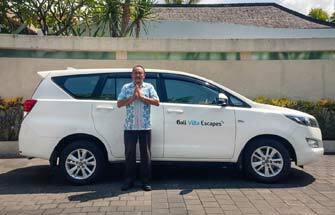 This is added to by the Putu and Ina the friendly and extremely happy villa staff who were there to make us feel welcome and cook the most incredible breakfasts and snacks throughout the day. The kids became very attached to them and it was really sad leaving. 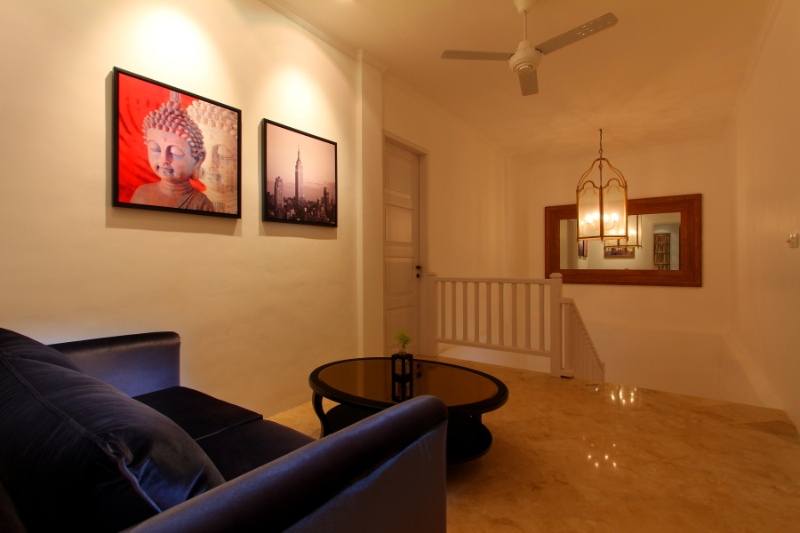 The villa itself was meticulously presented and maintained and the living areas were lovely. Plus the location was really handy as we were close to some really great restaurants to take the kids at night. 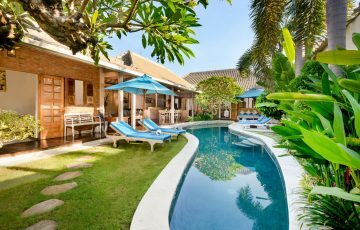 This was our first time staying with the family in a villa and we must say how fantastic the experience is - This easily gets a 10 out of 10 from us and the kids! 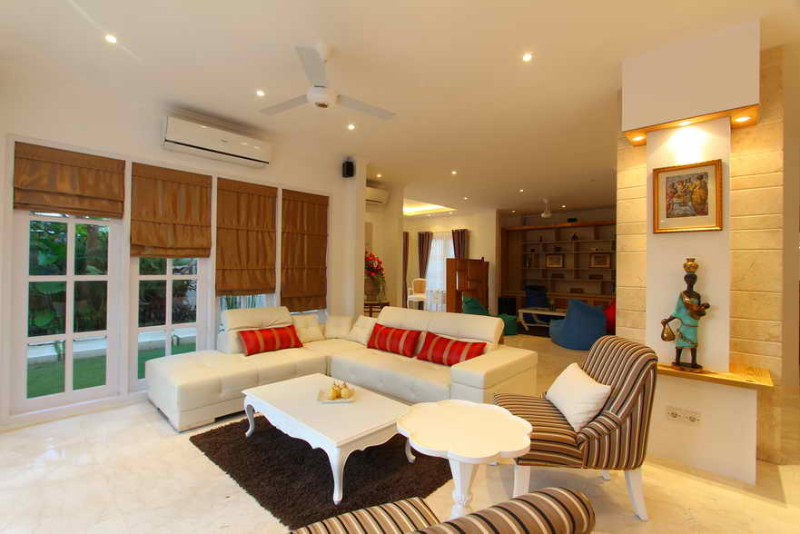 Loved the whole villa and found the staff to be extremely attentive. 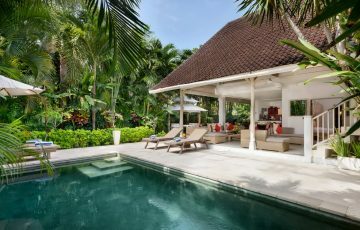 What made the villa even more attractive for us was it's proximity to the beach, Eat St and Seminyak Village - we love browsing the shops and then coming back to the villa for some peace, quiet and downtime. It was our little oasis and we can't wait to come back here again. 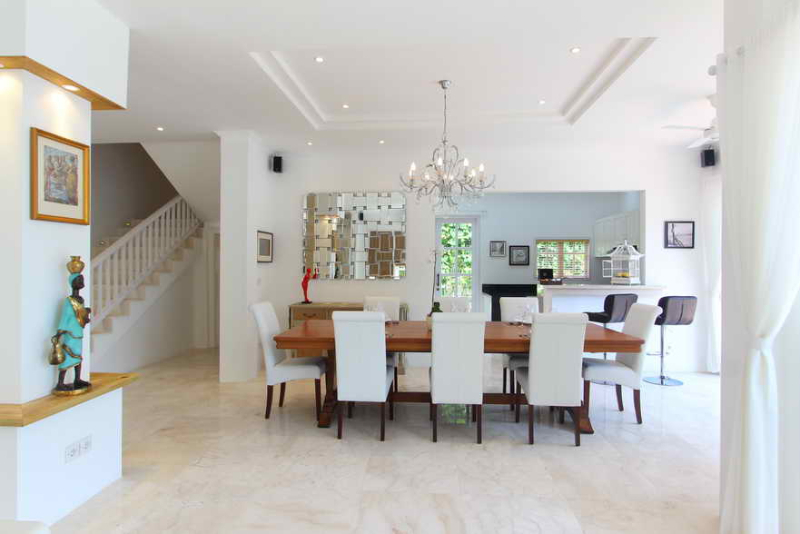 An amazing location and a fabulous villa that was absolutely perfect for our family. 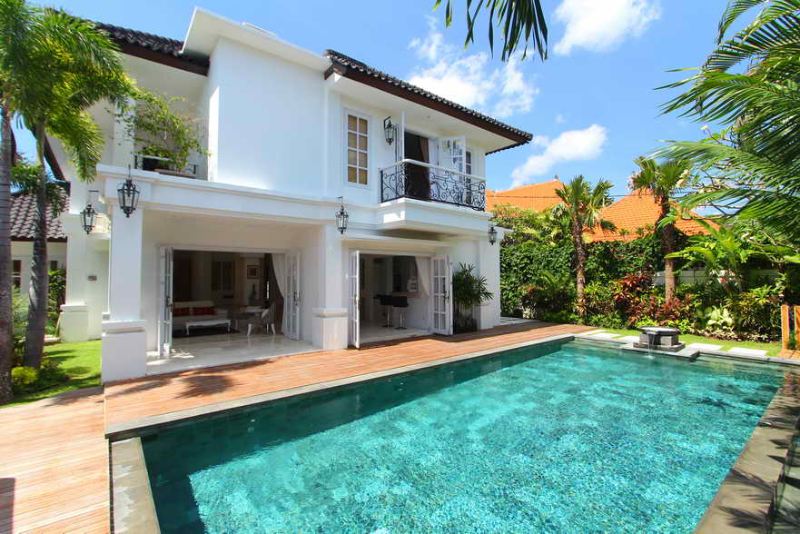 From the second we arrived to the moment we left we were completely in love with Villa Kencana - the staff, the top location and the great facilities ( including the pool) make this one of the best family holidays we have ever had - we will be back! 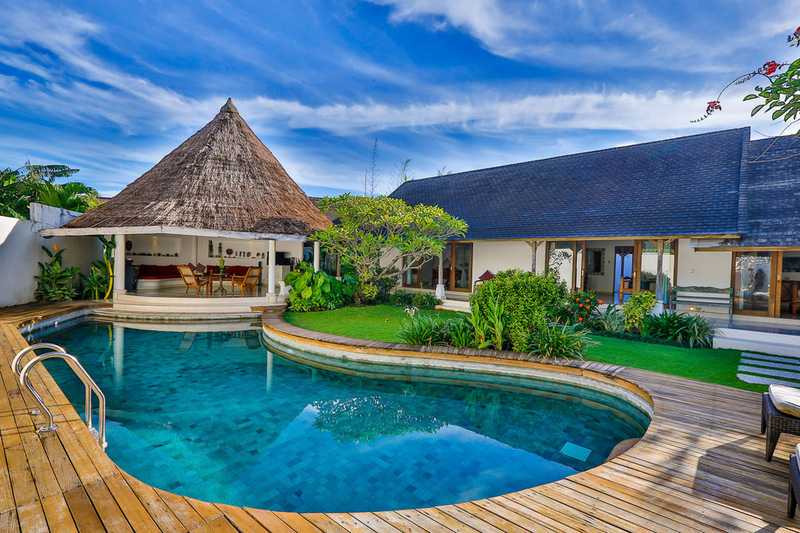 Loved everything about this amazing villa. It was even better than the photos! It's actually bigger than we were expecting and there was lots of room for everyone. The best part about the villa was the location. IT IS SO CENTRAL! 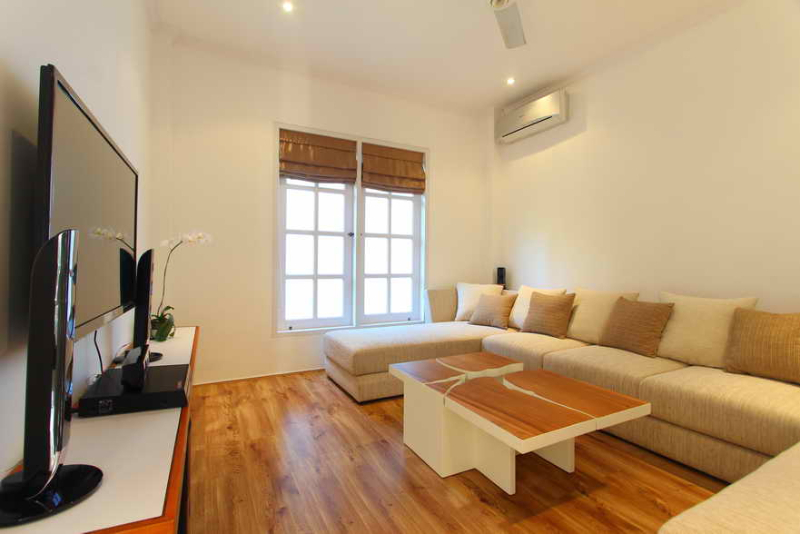 Check out Sisterfields & Seminyak Square - all within walking distance. What a fantastic time, such a great location.